Piston Seals - Les Joints Étanches R.B. Inc.
PB profile is a non-symmetrical hydraulic piston type U-Cup. Being Uni-directional in design, two PB seals must be used , back-to-back , in separate grooves to provide bi-directional pressure sealing. PB/N profile is a single-acting piston seal with an asymmetrical designed manufactured in homogeneous rubber material. It is particularly well suited for pneumatic or low pressure (˂1500 psi/100bar) hydraulic applications. Two PB/N seals can be used, back to back, in separate grooves to provide bi-directional sealing. PH profile is a single-acting piston seals using a Nitrile (NBR) sealing lip for excellent sealability mated to a fitted reinforced nylon anti-extrusion ring. KR ,These split rings made of Acetal material are primarily used as retaining devices when used in conjunction with PR-style piston seals. P1B profile is a complete pneumatic piston with a double cup seal and a vulcanized metal disc support. It is fixed to the piston rod with a lock nut to avoid loosening during service. P1B-1 is of similar design to the P1B-series but with added axial length for increased pressure resistance and better stability. 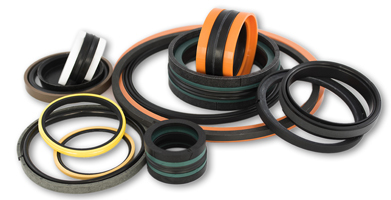 P2B Seals are two-part sealing units combining a low-friction, PTFE-based dynamic sealing element and an elastomeric loader ring insuring a fully energized device for both low and high pressure applications. ST/N profile Nylon back-up rings are primarily used as anti-extrusion devices to be used along side two-piece P2B-type seals. P2G profile is a high pressure, two-part seal set, consisting of a stepped-cut Nylon sealing ring and an elastomeric loader ring for producing pre-load. P3C double-acting piston seal is a heavy-duty seal assembly used for split pistons. The center portion of the seal is manufactured from fabric-reinforced Nitrile, and an Acetal L-Shaped bearing ring is located at either end to protect from extrusion damage. P4A is a bi-directional, piston seal for heavy duty applications. The PTFE cap and custom elastomer ring provide a low friction seal with excellent leakage control. The anti-extrusion rings allow for larger than normal piston clearances. P5B seals are designed for easy installation on one-piece pistons. Using a homogeneous center ring for excellent sealability, split nylon rings are added for extrusion resistance as well as split bearing rings for guiding. P5B-1 Similar to the P5B design, these seals have a heavier footprint to serve in a more heavy-duty environment. Les Joints Étanche R.B. Inc.